New Delhi: The Vice President of India, Shri M. Venkaiah Naidu has said that Medical Students should be trained to adhere strictly to their code of ethics and they should serve in rural areas at least once before getting their first promotion. He was addressing the gathering at the 60th Annual Day Celebrations of the Maulana Azad Medical College, here today. The Vice President said that India has been in possession of a treasure trove of knowledge in the field of medicine since the ancient times. While, all ancient civilizations of the world had developed their own medicinal systems, the healers of ancient India were well-respected and enjoyed state patronage, he added. Shri Naidu said that India has made considerable progress in many health indicators. He further said that life expectancy at birth has increased, infant mortality and crude death rates have been greatly reduced, diseases such as small pox and polio have been eradicated and leprosy has been nearly eliminated. While we have done reasonably well in controlling communicable ailments, the non-communicable diseases are increasing at an alarming rate and posing a major challenge on the health front, he added. The Vice President said that even though India produces the largest number of medical graduates in the world, data shows that doctor population ratio in India is extremely inadequate. He further said that India’s burden of non-communicable diseases, also called life style diseases is escalating. The change in environment and resistance to drugs, especially antibiotics has led to the evolution of superbugs which threaten global health security, he added. Shri Naidu said that we must ensure that our Primary Health Centres have proper facilities and diagnostic services. More holistically, we must focus our investments upon the social determinants of health: water, sanitation, nutrition, vaccination, early childhood care and so on, he said. The Vice President said that even though India produces the largest number of medical graduates in the world, data shows that doctor population ratio in India is extremely inadequate. We need to enhance more Medical Colleges and every District in the country must have at least one Medical College, he said. We must impress upon our young doctors that medical profession is a service to the society and not a lucrative business, he added. The Vice President said that we have to focus more on Public Private Partnership, especially in building infrastructure and promoting research and development. The Secretary, Health & Family Welfare, Delhi, Shri Sanjeev Khirwar, the Secretary, Department of Health Research and Director General, ICMR, Dr. Balram Bhargava, the Director, GIPMER, Dr. Archana Thakur, the Dean, MAMC, Dr. Sanjay Tyagi and other dignitaries were present on the occasion. “I am delighted to be here today in the presence of bright, young, budding doctors and healthcare practitioners on the auspicious occasion of the 60th Annual Day Celebrations of the Maulana Azad Medical College. 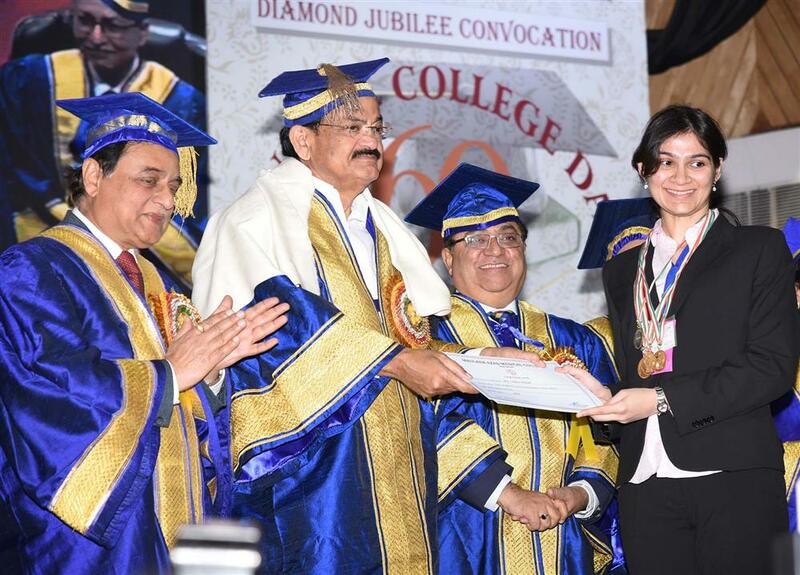 I am happy to know that this college is among the leading institutes for medical education in the country. Named after the great patriot and educationist, Maulana Abdul Kalam Azad the college which made a very humble beginning in 1958, stands tall today, as an embodiment of excellence in the field of medical education. With the sprawling campus of the college housing four hospitals – the Lok Nayak Hospital, GB Pant Institute of Postgraduate Medical Education & Research, Maulana Azad Institute of Dental sciences and Guru Nanak Eye Centre– I am sure all these institutes will provide unique learning environment to the students. It is heartening to note that the mission of the college is to provide in-depth knowledge as well as rigorous training to mould medical scientists who are well equipped to meet the professional and scientific challenges that will dominate the 21st century. India has been in possession of a treasure trove of knowledge in the field of medicine since the ancient times. While, all ancient civilizations of the world had developed their own medicinal systems, the healers of ancient India were well-respected and enjoyed state patronage. They adhered to the highest ethical standards of the day and practiced a strict code of conduct. They underwent rigorous training and were multi-skilled generalists. Enlightened healers like Charaka, the author of Charaka Samhita, Sushrutha, the father of plastic surgery, Nagarjuna who further expanded on the work of Charaka and Vagbhata who authored the ‘Ashtangahridaya’ further added to the robustness of Indian medicine through their scientific explorations and experiments. This glorious legacy of excellence in medicine is still being protected and enriched by the medical fraternity in India. India has made considerable progress in many health indicators. Life expectancy at birth has increased, infant mortality and crude death rates have been greatly reduced, diseases such as small pox and polio have been eradicated and leprosy has been nearly eliminated. While we have done reasonably well in controlling communicable ailments, the non-communicable diseases are increasing at an alarming rate and posing a major challenge on the health front. India is still grappling with a number of problems in the health sector. Even though India produces the largest number of medical graduates in the world, data shows that doctor population ratio in India is extremely inadequate. There is a deficiency in the number of para-medical personnel and other healthcare professionals who play a supportive role in our health set up. From insufficient number of hospital beds to a glaringly deficient primary health care system, we have inadequate healthcare infrastructure. All these shortcomings need to be addressed on a war-footing to provide universal health coverage. There is also a glaring urban-rural divide in the delivery of healthcare services with rural areas being served often by unqualified and unaccredited medical practitioners as well qualified doctors prefer to stay in urban areas. I have, therefore, been advocating the need to make it mandatory for doctors in government service to serve in rural areas for getting their first promotion. As mentioned earlier, India’s burden of non-communicable diseases (NCDs), also called life style diseases is escalating. At the same time, infectious and parasitic diseases still pose substantial challenges to the public health system in India, resulting in a double burden of disease. The change in environment and resistance to drugs, especially antibiotics has led to the evolution of superbugs which threaten global health security. Under such circumstances, we cannot afford to let the status quo continue. We have to make significant, targeted and outcome-oriented interventions in the critical areas of India’s healthcare set up. We must start by increasing our expenditure on health. The public health expenditure in India is currently at 1.15 per cent of the GDP. The National Health Policy 2017 had recommended increasing the public health expenditure to 2.5 percent of the GDP by 2025. The increased investment must go to primary healthcare, including preventive health action, health literacy and early detection. We must also ensure that our Primary Health Centres have proper facilities and diagnostic services. If we do not invest in quality diagnostics, we will lose valuable time in treating patients – especially in emergencies. More holistically, we must focus our investments upon the social determinants of health: water, sanitation, nutrition, vaccination, early childhood care and so on. The Government of India has taken a number of proactive steps to improve the delivery of health services in the country in terms of quality, affordability and access. To ensure quality healthcare, 20 new super speciality AIIMS like hospitals are being set up and 73 medical colleges are being upgraded with state-of-the-art infrastructure. Health insurance in India is a growing segment and hasn’t taken off fully. Several measures are needed to improve and expand insurance coverage taking into account the high out of pocket expenditure incurred on healthcare, which is driving poor families into unending debt traps. The ambitious Ayushman Bharat Scheme, the largest government sponsored healthcare scheme in the world, aims to provide healthcare facilities to over 10 crore families, covering urban and rural poor. From the Surakshit Mathritva Abhiyan to secure maternal health to Mission Indradhanush that aims to achieve 100 percent child vaccination by 2022 to the opening of more than 3000 Jan Aushadhi Kendras to provide affordable medicines, efforts are being made to envision and deploy out of the box, inclusive healthcare solutions. The majority of health care in India is obtained not in the public sector but in the private sector. Hence government and the private sector must constantly engage with each other. We have to focus more on Public Private Partnership, especially in building infrastructure and promoting research and development. To crystallize Universal Healthcare (UHC) or Universal Health Assurance (UHA), we must focus upon safeguarding the health and wellbeing of the vulnerable sections of our population, the women, the children, the poor and the differently abled. There is one aspect of healthcare that is often neglected and trivialized, the aspect of Mental Health Care. Mental wellbeing is crucial and complementary to physical wellbeing, especially in the high stress environment that we live and work in. There is also a need to strengthen our Medical Education Framework. We have to constantly set new benchmarks in quality and affordability of healthcare and encourage Medical Colleges and Universities to keep updating their curricula and teaching methodology. Medical Colleges and Universities must also set aside a portion of their annual budget for Research and Development activities. We must also actively encourage our healthcare practitioners to continually undertake research and exploration. We have to build collaborations with Medical universities of great repute from across the globe and replicate global best practices. Medical students should be trained to adhere strictly to their code of ethics. It must be impressed upon our young doctors that medical profession is a service to the society and not a lucrative business. I am sure that my young friends sitting before me today will soon be engaged in the relentless pursuit of the health and wellbeing of this nation, ensuring the achievement of the SDG targets and much more. Those who have the ability to heal and rejuvenate have a great responsibility towards the society. I hope that you will never lose sight of this great mission.